Nazneen’s Pursenality is a company that gives an alternative to people who want to shoulder exclusive high quality bags that help them express their individual personality rather than having one of a thousand cookie cutter designer handbags. 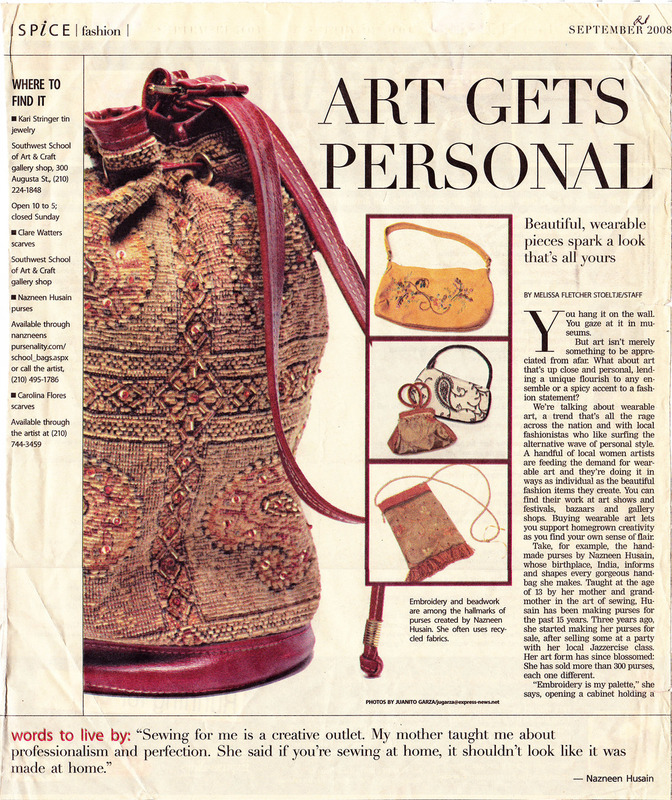 Those who appreciate artistic, ethnic work, can have durable and sustainable life from their bag, rather than settle for compromised workmanship from imported bags. Every bag is made individually with care and precision. All work is guaranteed against manufacturing defects. Custom orders provide customers a chance to have a bag made with their specifications. As our lifestyles and fashions have evolved, so have our bags. I started Nazneen’s Pursenality to give an alternative to people who want to shoulder high-quality bags that express their individual personality rather than having one of thousands of similar factory-made handbags. I make customized bags for men and women. Through my work, I make a difference in people's lives by providing a product that is not only functional, but also artistic. I engineer bags with enduring designs, uncompromising materials, and haute couture workmanship. My Indian heritage has given me a passion for rich textiles and intricate handwork. Many times I repurpose the work done on garments onto my bags or use fabric being discarded by furniture stores. My purses are a reflection of the beauty I find in these materials. There were some who were concerned that a Muslim woman in hijab would have a difficult time selling her purses at public places. But following my mother’s advice, I welcomed everyone with a smile and the customers only saw my talents. I want to be the smile of a veiled woman rather than the face of an oppressed woman. I am a social entrepreneur; I have been able to help others through providing jobs within my company, helping them start their own art businesses, and teaching others to sew. I have been invited as a speaker to encourage and inspire others. At a recent gathering of foreign born and refugee entrepreneurs, I was asked to be a facilitator for a Cultural Conversation. I was invited by a professor to speak to Fulbright Scholars visiting from Germany. I spoke of my own startup with a Girl Startup program at Venturelab and local Fiber Artist Associations wanted to know the artist behind the work. My art has been showcased in newspapers, and featured in magazines and on live news broadcasts. I see other Muslim women inspired and hopeful when they see my success. I invite you to visit my website to learn more about my story and view my portfolio. I had the opportunity to be a guest speaker at Venturelab's Girl Startup program. Encouraging entrepreneurship among girls. It was such a joy to share my own experiences as a local female entrepreneur and business-owner, as well as to meet these amazing young ladies! If you are interested in taking private lessons with me at my home studio, please write a little about your sewing experience. I have a few questions that will help me to better understand what you already know about sewing and how to better guide you to have a successful set of lessons. 1. Have you done any sewing before either on machine or by hand? 2. Will it be possible to bring your own sewing machine? 3. What times are best for you to come for classes? What do you get for $30 an Hour? Go Sew- When you complete your first course you will be equipped to repeat the process to make a number of like bags and will have learned a lot about how to cut fabric, use certain notions, embellish, and basically have fun on your own. Average time to finish a basic purse should be four days of two-hour classes. Please don't hesitate to call me at 210-380-7894 to discuss any more questions you may have. I can also give references of others who have taken my classes. If you would like to learn to sew purses, call me at 210-380-7894. For more details check out Sewing with Nazneen on my about page.